Haddonfield resident and furry companion will be featured in the Rescue Men’s Calendar. 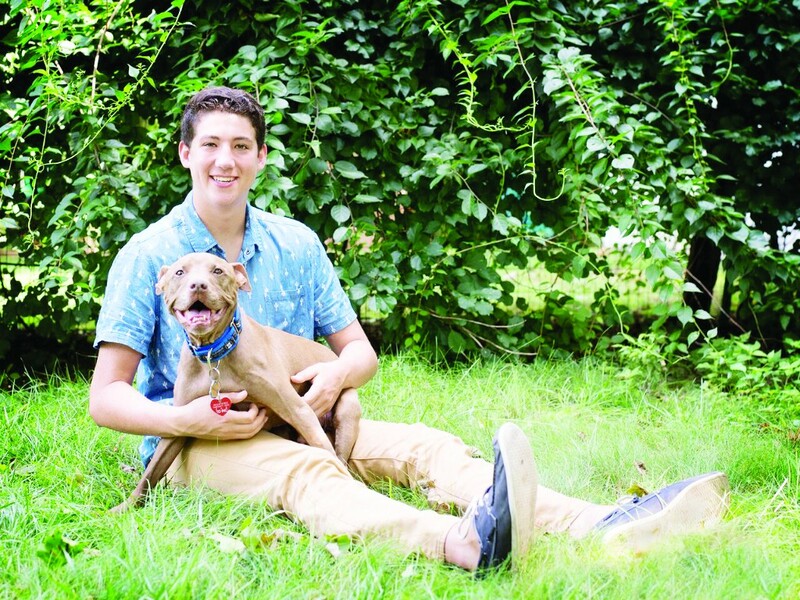 Haddonfield native and 19-year-old University of Delaware student Conner Lambert and his rescue dog, Aladdin, just got a little more famous. The duo is featured in the month of September in the 2018 Tails of RescueMen Charity Calendar. Lambert humbly accepted the title as September’s Rescue Man, making him the first college student to be featured in the calendar. Co-founder of the calendar, Felicia Greenfield, joined forces four years ago with New York City casting director Jen Halpern to spread awareness about rescue dogs and their owners, in hopes of swaying animal lovers to “adopt and not shop” by featuring men, their stories and rescue pets for each month. Although the calendar’s primary focus is on rescue dogs and cats, it has also featured other companion animals, including birds, bunnies, pigs, chickens and turtles. Two primary goals of the calendar is to encourage people to “adopt, not shop” for pets due to the overcrowding at shelters nationwide and raise funds to help shelter animals. Each year, approximately 1.5 million shelter animals are euthanized, according to the ASPCA website. ‘’It’s a really positive way to send a very important message,’’ Greenfield explains. To be featured in the calendar came as a shock to Lambert when he received a call that he would be chosen among applicants from all regions of the country to share his story. Lambert’s mother, Michele Schaffer-Stevens, has been rescuing emaciated dogs throughout Lambert’s childhood, passing her passion for animal rescue down to her son. His efforts assisting his mother and stepping in to be a caretaker for animals in need resulted in his recognition from Greenfield and Halpern. ‘‘We choose Conner because he has lived most of his life as a rescue man and he deserves special recognition. We would love other young adults to look to him as a role model,” Greenfield said. Lambert, a college sophomore studying accounting, shared some of the challenges he has faced as a foster parent of animals in need. Lambert was responsible for helping care for an abused and underweight dog one year ago. Although the dog ended up passing away, he remembered carrying it around, as he was unable to walk on his own. “It breaks my heart because how could someone do that to an animal who can’t defend itself? It’s sad because he never got to have his happy ending, but at least he knew what love felt like from us before he died,” Lambert said. Although challenges are a part of being a rescue man, it does come with rewards. The first time Lambert met Aladdin, the two instantly clicked. Lambert was 16, playing baseball, when his mother brought Aladdin to come watch. As Aladdin hobbled over with two broken back legs to say hello, Lambert instantly fell in love. What was suppose to be a foster pet turned into a new addition to the family. “It’s one of the greatest connections I’ve ever had with an animal,” Lambert adds. Every weekend, Conner still manages to come home to his mother’s house and enjoy the company of his furry companions, Bullie, Brady, Parker and Aladdin, admitting Aladdin often still sleeps in the bed next to him. One of the most difficult parts about being away at college is sleeping without his furry friend by his side. “I firmly believe that when you rescue a dog, they are rescuing you,’’ Lambert explains. Lambert encourages those to “adopt and not shop” and to give back to animals in need by purchasing a calendar. All proceeds go to supplies such as beds and toys to Halpern’s organization, Pillows for Paws, that are then distributed to the Animal Care Centers of NYC and any smaller shelters that reach out to them for assistance. ‘’Everyone uses a calendar at the house, and all of that money goes toward a good cause. Every single person on that calendar has an incredible story,’’ Lambert said. For more information or to order a calendar, go to www.rescuemen.org.